Welcome to Freeport Bahamas airport site, your source for flights, hotels, resorts, activities, car rentals, and information about Freeport, Grand Bahamas Island. Freeport Grand Bahamas Island is known for its beautiful hotels and resorts, most which pamper their guests in luxury and comfort. 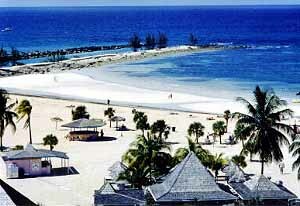 All hotels and resorts in Freeport are close to the beaches, casinos, golf, and shopping. The various hotels have a welcoming atmosphere that emphasizes friendly and hospitable service, with excellent facilities as well as comfortable guest rooms and public areas. One such resort, just 7 miles from the Freeport Airport, is the Xanadu Beach Resort, a first-class exclusive resort on the beach featuring a full service marina with 66 slips and on-site dive center. The resort offers a wide variety of activities for those who enjoy undersea adventures, scuba diving, jet skiing or parasailing. Copyright ©1999-2006. All Rights Reserved.